Alcohol Toxicity- What is Alcohol? A toxin is a poisonous substance. The liver acts as a mechanism for clearance, detoxification, and excretion. Most ingested substances and inhaled substances,as well as substances absorbed through the skin, are chemically altered as they pass through the liver. The liver is vulnerable to toxicity caused by a variety of sources because of its central role in metabolic processing. It is well known that drinking alcohol may raise the risk of liver toxicity. In addition to alcohol, liver toxicity can be triggered by exposure to over-the-counter medications, prescription medications, herbal and natural supplements, vitamins, minerals, street drugs, environmental pollutants, and even common household products. An individual with chronic liver disease may be more vulnerable to toxin sensitivity. If an individual with only a small amount of remaining reserve liver function cannot tolerate a toxin, that person may experience a worsening of his or her condition. Alcohol is a legal drug that is classified as a depressant based on its effects on the central nervous system. Consuming alcohol slows down the central nervous system, creating a time lapse for vital communication from the brain to other areas of the body. 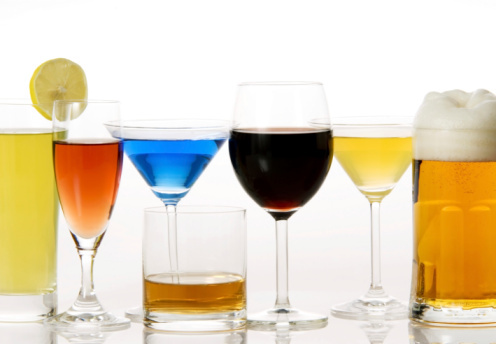 Once alcohol enters the bloodstream, it affects all of the body's cells and systems. Alcohol is produced when certain microorganisms metabolize carbohydrates in the absence of oxygen. This process is called fermentation. The fermentation process occurs naturally in grains and fruits. The ingredient in alcohol that is toxic to the liver is called ethanol, which is found in beer, wine, and liquor. Alcohol contains no nutrients. In fact, drinking alcohol can actually create vitamin absorption problems in those who drink. Malnutrition is a very common problem in regular drinkers. Once alcohol is consumed, it travels down into the stomach, where 20% enters the blood stream through tiny blood vessels. This accounts for the initial ''rush'' created by drinking alcohol. The other 80% travels to the small intestine, where it is then absorbed into the bloodstream. All ingested alcohol circulates throughout the bloodstream until it reaches the liver. The liver plays the important role of metabolizing alcohol- that is, using enzymes to break it down. The liver is only capable of metabolizing one standard drink per hour. When more than one drink or standard unit is ingested within an hour, the alcohol continues circulating in the bloodstream until the liver can process it. Alcohol waiting for processing saturates the blood and makes its way to other body tissue until the liver can process it. Nothing can expedite the processing time for alcohol. A cup of coffee, certain foods, or a cold shower will not cause one to "sober up". The liver requires roughly one hour per standard drink to process the alcohol. Alcohol affects every aspect of the body and bodily functions, and it has both short-and long-term effects. Drinking alcohol causes impairment in balance, coordination, and reflexes. Additionally, drinking alcohol affects the drinker's judgment and reasoning skills. Sometimes this is experienced as a false sense of confidence, or the shedding of a typical inhibition. It is widely known that drinking too much alcohol will damage the liver. But how much is too much? Too much can only be defined on an individual basis. Too much alcohol means too much for your body. There isn't a standardized alcohol threshold that can accurately predict your chances of developing an alcohol-related liver disease. Experts suggest that men have no more than 2 drinks per day and that women have no more than 1 drink per day. Drinking alcohol is very common in many cultures around the world. Sometimes it can be difficult to differentiate between ''social drinking'' and ''problem drinking''. Many people do not realize that moderate drinking can produce dangerous consequences. A person does not have to drink all day to engage in problem drinking or drinking that leads to liver problems. Alcohol abuse, alcoholism, and binge drinking are all very prevalent in the U.S., despite widespread awareness of the dangers of alcohol consumption. It is very important to keep alcohol units in mind when drinking. Many servings of drinks exceed one standard unit. Check the percentage of alcohol content in beer; it can range from 3.2% to as high as 29% for some craft beers. Beer with greater than 5% alcohol content exceeds one standard unit for a 12 fl oz serving. Wine alcohol content percentages range from 8% to over 20%. Additionally, wine glasses vary in size and can hold from 8 to 14 fluid ounces of liquid. The variation in glass size makes pouring a standard unit of wine difficult. Glass variations and mixers can make pouring a standard unit of 80 proof liquor difficult. A "highball" glass holds between 8 and 12 fluid ounces. An "old-fashioned" glass holds between 8 and 10 fluid ounces. A "Collins" glass holds 14 fluid ounces. Women have a 50-100% higher mortality rate from chronic alcohol abuse than men. The detrimental effects of alcohol are more severe in women than men due to chemical or biological differences within the body. It is believed that the way that alcohol is broken down in the body is different between the sexes. Women's stomachs may also contain less of a key enzyme called alcohol dehydrogenase, which is an essential enzyme in the initial process of breaking down of alcohol. This means that women may break down alcohol at a slower rate, consequently exposing the liver to toxins for a longer period of time. Women also develop chronic liver diseases after a comparatively shorter time period and with less alcohol consumption than men. Problem drinking can be difficult to define. Alcoholism, a condition that can be genetically inherited, is one of the most prevalent psychiatric conditions in the U.S. Despite the fact that alcoholism is so common, it is often overlooked; it may not be investigated in a clinical environment until significant emotional, physical, or environmental damage has occurred. Alcohol consumption is legal and is widely regarded as socially acceptable in the U.S.; as a result, individuals who have questions about problem drinking are often left to their own devices. One of the most widely used tests for assessing drinking habits is called the CAGE Questionnaire. This is a short, four-question self-assessment quiz to help an individual consider his or her personal drinking habits. Individuals with a score of 2 or more "yes" answers are considered to engage in problem drinking and are urged to consult a doctor. A: Have people annoyed you by criticizing your drinking? E:Have you ever had a drink first thing in the morning (eye-opener) to steady your nerves? This self-assessment questionnaire includes three of the CAGE questions and one additional question (the first one) that has proved important for accurate results. Individuals with a score of 2 or more "yes" answers may be engaging inproblem drinking and are urged to consult a doctor. T: Does it take more than 3 drinks to make you feel high? A: Have you ever felt annoyed by people's criticism of your drinking? C: Are you trying to cut down on drinking? E: Have you ever used alcohol as an eye-opener in the morning? The short, four-question RAPS4 questionnaire has proven to be more accurate than the CAGE questionnaire, although it is not as widely used. The acronym stands for (R) remorse, (A) amnesia, (P) performance, and (S) starter drinking behavior. Individuals answering "yes" to any one of the following questions may engage in problem drinking and are urged to consult a doctor. Longer alcohol screening questionnaires,such as the MAST Test (Michigan alcohol screening test), are also available. Problem drinking, alcoholism, and/or liver disease may require one to stop drinking alcohol. It is estimated that 90-100% of those who regularly drink more than recommended amounts of alcohol have alcoholic fatty liver disease. Alcoholic fatty liver is the first stage of liver disease, and it can progress to more severe, even life-threatening conditions such as cirrhosis. Alcohol affects the way in which the liver stores fat. Continuing to drink alcohol once fat has accumulated will exacerbate the fat problem . When alcohol consumption stops, the liver has the ability to shed the accumulated fat and repair itself. Scarring of the liver caused by cirrhosis and liver fibrosis is irreversible, but it is never too late to quit drinking. By refraining from drinking alcohol, one can prevent further damage to the liver and halt the progression of disease. Individuals with cirrhosis must quit drinking to prevent liver failure. Individuals with cirrhosis who continue to drink are ineligible for liver transplantation. A doctor can help you find an approach to quitting alcohol that is right for you. Medication, therapy, and support groups, especially when used together, have been found to be effective in helping people to quit drinking. Depending on liver function, medication may not be an option. Most organizations also have programs for the families and friends of individuals suffering from addiction. If you have liver disease, or if you have any concern about your drinking habits, it is important that you take steps to quit drinking. Speak with your doctor if you have concerns about your drinking and would like to stop. There are options for those who would like to quit drinking alcohol. Depending on the nature of your drinking, quitting "cold turkey" may not be a safe option. If you experience severe withdrawal symptoms at any time, you should contact your doctor immediately. Severe alcohol withdrawal symptoms can lead to life-threatening conditions. Between 12-24 hours after stopping drinking, one may experience mild hallucinations. Typically, the individual can differentiate between reality and these hallucinations. These hallucinations are different from those experienced in delirium tremens. Delirium tremens (DTs)is a severe withdrawal symptom that occurs when a heavy drinker quits drinking. DTs typically occur within 72 hours after the last drink, but can begin up to 10 days later. DTs are considered a dangerous condition and a medical emergency. If you or someone you know is experiencing any of the symptoms of delirium tremens, seek immediate medical assistance. Most medications and ingested substances are altered chemically as they pass through the liver. The liver functions as a mechanism for clearance, detoxification, and excretion. Because of the liver's central role in metabolic processing, it is particularly vulnerable to toxicity from drugs and medication. If the functions of the liver are altered, it may enhance or predispose an individual to toxicity from medications. In addition to a predisposition to medication toxicity, an individual with a chronic liver condition may no longer tolerate a medication in the same way. When unpredictable reactions to medications occur, patients with only a small amount of reserve function remaining may experience a worsening of their condition. Pain medications are one of the most widely used medications, with both prescription and over-the counter medications available. The class of non-steroidal anti-inflammatory drugs (NSAIDs) encompasses the largest class of medications used for common maladies such as headache. NSAIDs can cause unpredictable liver toxicity. NSAIDs are known to increase the tendency for bleeding by inhibiting platelet function in cirrhosis where coagulation (the ability of the blood to clot) is already impaired. Medicines, especially the seemingly harmless acetaminophen (the active ingredient in many over-the-counter medications) should never be taken with alcohol. Many prescription and OTC drugs and medicine, including herbal medicines, contain chemicals that could be dangerous to liver cells, especially when taken with alcohol. Some medications for metabolic disorders may cause liver damage. In the event you are prescribed such a medication, please consult your doctor about possible liver cell damage. An extremely cautious approach is needed in order to avoid medication toxicity in those with chronic liver disease. Medications should be started only when absolutely indicated and when no other option exists. Each medication that is required should be evaluated for possible liver toxicity. If liver toxicity has been reported, an alternative with lesser or no adverse hepatic effects should be sought. If no options or safer alternatives exist, then the medication should only be started under the close observation of a medical professional. Patients with chronic liver disease should learn to recognize liver-related symptoms, for example:jaundice, itching, loss of appetite, fatigue, and pain inside or under the right side of the rib cage. Some vitamin and mineral supplements can be dangerous when taken in excess. Certain liver conditions affect the ways in which the body absorbs and stores vitamins and minerals. Some supplements also affect the ways in which other supplements are absorbed or stored. It is important to discuss supplementation with your doctor. In general, the body utilizes vitamins and minerals best when they are derived from a food source rather than from a supplement. There are two categories of vitamins: water-soluble vitamins and fat-soluble vitamins. Water-soluble vitamins flush quickly from the body and need constant replacement. Fat-soluble vitamins are stored for longer periods of time in the liver and fatty tissue. Because fat-soluble vitamins do not flush as quickly from the body as water-soluble vitamins, they pose a greater risk for overdose and liver toxicity. Fat-soluble vitamins that may pose a risk of toxicity include vitamin A, vitamin D, vitamin E, and vitamin K.
Vitamin A in excess can cause liver damage, nervous system damage, increased pressure in the cranium, stunted growth, and hair loss. Vitamin D in excess can cause weight loss, irritability, stunted growth, and kidney damage. Vitamin E in excess can cause nausea, fatigue, excessive bleeding, and digestive disorders. Vitamin K in excess can cause liver damage and the breakdown of red blood cells. If you have any questions about vitamin supplementation, please speak with your doctor. Macrominerals and trace minerals are the two categories of minerals that the body needs. The body requires more macrominerals than trace minerals. Macrominerals include calcium, sodium, chloride, magnesium, phosphorus, and potassium. Trace minerals include zinc, iron, copper, selenium, iodine, manganese, fluoride, molybdenum, and chromium. Mineral supplementation should only take place when a deficiency is present and under a doctor's supervision. Consuming excess amounts of trace minerals such as iron, zinc, and copper could lead to dangerous consequences. Inhaled fumes from paint thinner, bug spray, and other aerosol sprays are picked up by the tiny blood vessels in the lungs and carried to the liver, where they are detoxified and discharged into bile. The amount and concentration of those chemicals should be controlled to prevent liver damage. Make sure that good ventilation and a mask are used. Cover your skin and immediately wash away any chemicals that come into contact with your skin using soap and water. Certain common and unnatural ingredients in our foods are toxic to the liver. Try to consume foods free of artificial ingredients.